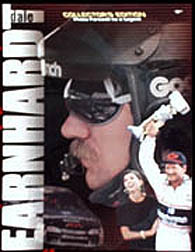 We were not planning on offering anything special for Dale Earnhardt. His tragic death brought forth more memorabilia than we have ever seen relating to one driver. However, we came across this beautiful photographic book we believe is a true piece of Americana that was published by photographer Brian Spurlock, whose work has been used to honor other sports heroes. A lot of time, effort and respect was put into this 112 page photographic book. Dale Earnhardt was a one-of-a-kind true American hero who will be sorely missed by all who appreciated his competitive spirit and determination. Size: 8 3/8"x 10 7/8"